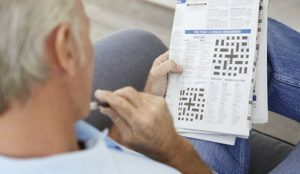 As should be obvious, that man could well be me, a retired old geezer solving crossword puzzles to keep himself out of mischief. Since I started to work when most middle class Indians were still in college, my great ambition was to retire when I was fifty. I was not able to but did retire at the age of 52. At that point of time, I had very valuable assets, a reasonably good pension, money in the bank and most importantly, an empty nest with an independent son having flown the coop. I was however pulled out of retirement on other occasions on short term assignments but, by and large, even those did no take away my attitude towards life, one of taking it easy and not being ambitious to achieve big goals. I am now 75 and so when I came across this piece of information it was an Aha moment for me. 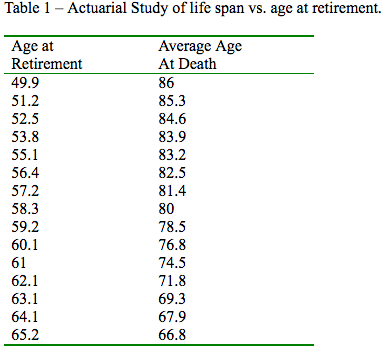 Just look at this table from the article. 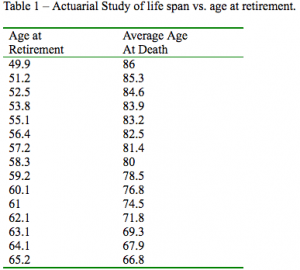 Table 1 – Actuarial Study of life span vs. age at retirement. And just as I was planning the outline for this post, I came across another very interesting piece of information which is even more interesting. I hope that this young man succeeds and spends many more relaxed years solving crossword puzzles or whatever else that may interest him. I wish that I had had that kind of an environment when I was that age! This entry was posted in Books / Reading, People, Philosophy, Self Improvement and tagged BBC Capital, Crossword puzzles, Dr. Ephrem (Siao Chung) Cheng. Bookmark the permalink. My plan was to retire at 55, which was the earliest I could do it at the company I worked for — and I did, after taking two months of of paid vacation. A year later, I was back at work, contracted for the same job I had retired from. The stress was so much lower, virtually nonexistent, getting paid to do the parts of the job I really enjoyed with very little supervisory oversight or interference. Knowing that I could walk away with no adverse consequences really made a difference. Over the next 11 years, I was “employed” about half the time. And I did walk away from it before I had to! There was 6 months left on my last contract when I told them I was finished and not interested in coming back. Way to go Mike. From your blog posts I can also see that you are very active and travel a lot which is possible due to retiring at the right age. I had read about someone in that group and thought that seemed like a good idea if a person’s other family obligations could accommodate what’s involved. This particular young man obviously has not started a family yet and I suppose that he will once he has achieved his financial goals when he will be able to spend more time with his family! interesting stats…the young man will probably cruise life, picking up work here and there. Or be like Mike and find himself back semi-regularly in contract work…. It will indeed be interesting to follow that young man’s progress in life. wow. it says I will live to 76.8 months! and there I was counting on going right on through to my 80’s and 90’s! i’m just now learning how to relax. so I hope it’s a bit longer than the stats say. I also want to live long enough to see the man with the comb over eat crow. and somebody with an intellect more than an 8 year old take his place!